Fallow deer (Dama dama) have long been the dominant deer species in the New Forest; indeed, William I’s declaration of the area as a Royal Forest was chiefly to conserve hunting interests for this species. It is difficult to assess what numbers may have occurred on the Forest at that time; the earliest reliable census is that of 1670, when the Regarders gave a return of 7,593 fallow deer and 357 red deer within the Forest boundaries. A government report of 1789 gives an average number of fallow deer present each year as 5,900, and numbers seem to have been maintained at roughly this level until the 1850s. In 1851, the New Forest Deer Removal Act provided for the ‘removal’ of deer from the Forest within three years of the enactment. Total extermination of such a large population of animals, scattered over so large an area, proved of course totally impracticable, but numbers were certainly dramatically reduced and population estimates in 1900 (Lascelles 1915) gave a figure of 200 head. 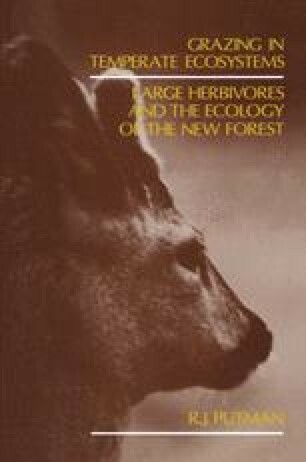 From then on the population has gradually expanded, and is now maintained by the Forestry Commission at a level which has been estimated at about 2,000 animals (Strange 1976). The deer are free to wander over the entire Forest area, within and outside Inclosures, though most of the population are concentrated within enclosed woodlands.